Feld Entertainment’s newest Disney On Ice production is another must-see presentation this holiday season. The much-awaited Disney on Ice season is back at the Smart Araneta Coliseum from December 25 to January 4! Join Mickey Mouse, Minnie Mouse, Donald and Goofy as they go along with Disney's well-loved princesses on their adventures to fulfill their dreams. Disney's Dare to Dream features a spectacular celebration of royal proportions. Feld Entertainment combines the contemporary stories of two modern-day princesses, Rapunzel from Tangled and Tiana from The Princess and The Frog along with the classic elegance of Cinderella and Snow White. Dare to Dream will surely bring audiences away via exciting journeys where dreams really do come true. Audiences begin their magical, musical voyage in New Orleans celebrating the story of The Princess and the Frog with Princess Tiana and Prince Naveen, and then escape into the enchanted forest with Snow White and the Seven Dwarfs. The trip continues to Cinderella’s kingdom in her search for true love and follows Rapunzel as she discovers the world beyond her tower on her quest to see the floating lanterns. The Disney Princesses then come together for the first time on ice during the finale, to welcome Rapunzel into their royal court in the ultimate princess experience. In adapting Tangled to the ice for the first time, Director Patty Vincent was challenged with how to convey all of Rapunzel’s hair without interfering with the skating. During the segment, 2,000 feet of silk representing Rapunzel’s magical, golden tresses winds throughout the rafters of the arena and drapes down to the ice for use in a heart-stopping aerial act never before seen in a Disney On Ice production. 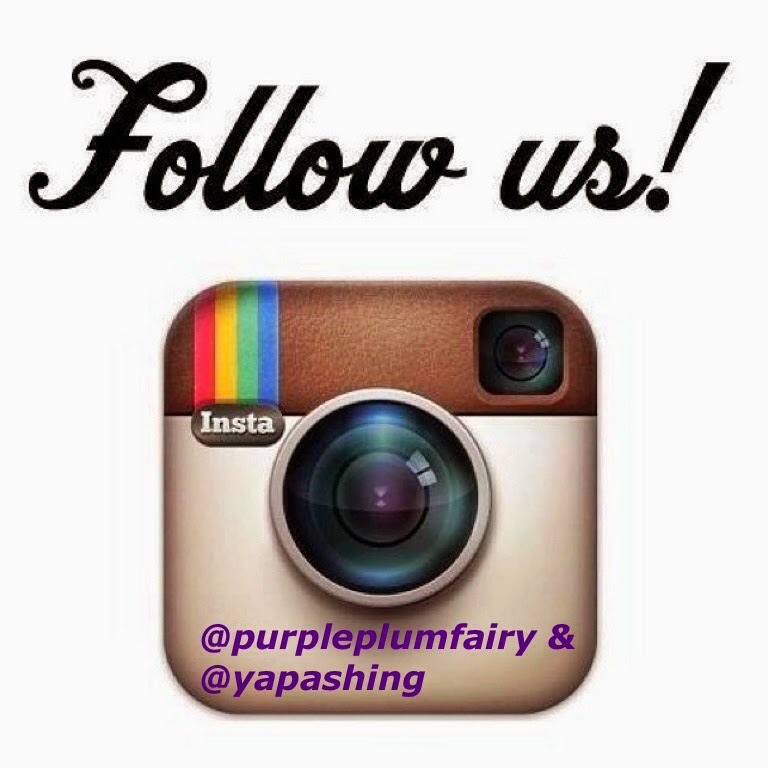 Rapunzel and Flynn Rider escape the tower, flying 25 feet up in the air and performing daring acrobatics. 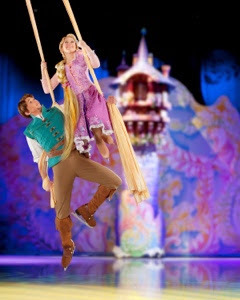 Under the direction of Choreographer Cindy Stuart and Aerial Trainer Anna Kaminnik, the performers mastered the blend of ice and aerial choreography in which Rapunzel and Flynn fly above the arena floor and slowly descend to the ice in a fluid motion, creating a feeling of constant movement. Stuart was able to contrast the beauty of the aerial act by showcasing the athleticism of the skaters when Rapunzel and Flynn stop at the Snuggly Duckling tavern on their way to see the lanterns. During this energetic sequence, the pub thugs break into a rowdy show tune medley, and the scene turns into a trick section with performers doing cartwheels, handstands, jumps and leaps on the ice and the props. The adventurous nature of Rapunzel’s story allowed Costume Designer Ivan Ingermann to incorporate unusual fabrics and silhouettes into his costumes. 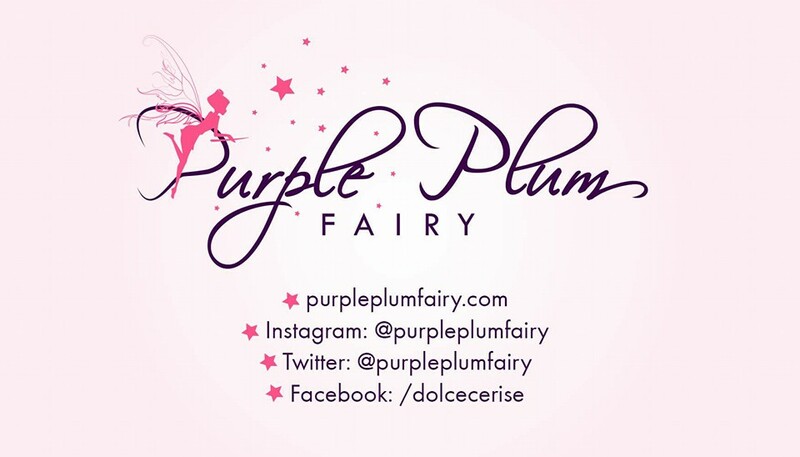 Rapunzel’s world is mainly full of rich colors and textures and romantic silhouettes.However, during the Snuggly Duckling segment, Ingermann designed costumes for the pub thugs using faux fur and faux leather, materials not normally seen in an ice show. Another distinctive design element of Dare to Dream is the revolving set, an idea conceived by Scenic Designer Stan Meyer. By designing a rotating piece that transforms to specifically fit each of the unique settings of the stories, Meyer was able to create one major centerpiece with four entirely different environments. When the set morphs into Rapunzel’s forest, a paneled backdrop of pastel flora and butterflies opens and a majestic tower slowly emerges, rising from the ice as golden hair falls from the window. Lighting Designer Peter Morse incorporated these same pastels and royal colors by surrounding the audience in rich shades of purple, a prominent color in Rapunzel’s world. When Rapunzel and Flynn Rider finally reach the end of their journey, the entire arena goes dark as a single lantern slowly floats up into the air, and suddenly, lanterns illuminate the sky above the audience. In contrast to the colorful and playful world of Rapunzel, to set the mood for the story of Snow White, the lighting had to take on a darker and more mysterious quality. As the story begins, the lighting dims and a thin layer of fog fills the ice. Soon a flash of light and dark shadows appear signaling the arrival of the Evil Queen. 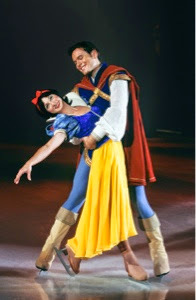 When it comes time for Snow White to flee into the magical forest for protection from the Queen, Morse focused on the use of black lights to highlight her frantic pace. As she finallyescapes the forest and arrives at the door of the Dwarf’s cottage, the ice is bathed in rich golden colors, signaling the calm after the storm and her newfound safety. Being the Princess who started it all, the costume design for Snow White is a classic silhouette that will be easily recognizable by audiences young and old. The traditional yellow and blue dress was made for swift, yet graceful, movement on the ice, twirling and flowing as Snow Whiteglides through her world. Audiences will also be delighted to see all Seven Dwarfs make an appearance in Dare to Dream, each outfit as uniqueas the Dwarf wearing it. 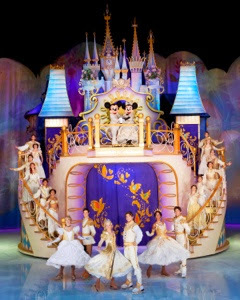 In addition to the pair skating and elegant ice dancing showcased in Dare to Dream, Cinderella features synchronized skatingby a team of 20 performers portraying the palace guards searching for the owner of the glass slipper. More than half the cast performs this fast-paced and complex precision number, creating lines, formations and constantly moving patterns on the ice. Light-heartedelements throughout the segment provide a contrast from the romanticism and precision of many of the scenes. Cinderella’s mice friends make an appearance singing and dancing while they make her a dressfor the ball. Cinderella’s stepsisters are on hand as well,amusing the audience with their comical antics. With a swish of her magic wand, a flash of light and those three little words, the Fairy Godmother transforms Cinderella beforethe ball. From a cloud of smoke, a sparkling carriage emerges, drawn by four white horses and glistening like a crystal ball in the darkness, creating a magical moment asCinderella rides toward the castle. Later, as Prince Charming and the Duke ponder the identity of the beautiful girl from the ball, the ice is dark, save for the moonlight streaming through tall windows on either side of the ice and forming a dark hallway between them, an illusion created by gobos and spotlights. Popular color palettes and designs from the Harlem Renaissance became a major source of inspiration for The Princess and the Frog. When Dare to Dream opens in New Orleans, vibrant orange and golden yellow light fills the arena, matching the bright colors of the costumes inspired by the period. Set against a French Quarter backdrop painted in rich reds, purples and greens, flappers and banjo players revel on a balcony while page boys and other townsfolk dance on the ice below, creating a multilayered street party.The opening number, “When the Saints go Marching In,” combines jazz-influenced choreography and the Charleston to create a vivid and energetic street scene. Disney On Ice presents Dare to Dream seamlessly merges the classic with the new, maintaining the timelessness of some of the most cherished stories of all time, Cinderellaand Snow White and the Seven Dwarfs, while also incorporating popular songs and unforgettable scenes from Disney’s newest fairytales, Tangled and The Princess and the Frog. From the lighting and scenery to the music, choreography and costumes, each element of Disney On Ice presents Dare to Dream magically combines to create a memorable show for the entire family. To purchase tickets, visit www.ticketnet.com.ph or call 911 55 55 for inquiries. Tickets are now available at all Ticketnet outlets nationwide and through online www.ticketnet.com.ph. Call 911-5555 for ticket inquiries. 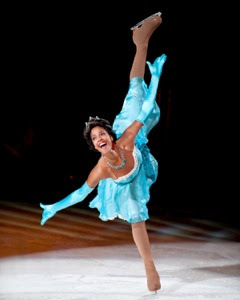 For more information about Disney On Ice presents Dare to Dream, visit www.feldentertainment.com/daretodream.